Anaerobic activity in sewer systems results in the production of organic compounds and inorganic compounds. Many of the compounds are malodorous, including volatile organic compounds (VOCs), volatile fatty acids (VFAs) volatile sulfur compounds (VSCs) and the inorganic gases, such as ammonia (NH3) and hydrogen sulfide (H2S). These compounds are responsible for a number of significant problems, including malodor complaints and lawsuits, increased operational costs, health risks, concrete and metal corrosion and the inflow of anaerobic wastewater into activated sludge processes that may trigger undesired filamentous growth. A review of anaerobic activity and the biological production of malodorous compounds can be useful in preventing the problems associated with these compounds. Anaerobic activity, or respiration, is the degradation of carbonaceous wastes or organic compounds (CH2O) by bacteria without free molecular oxygen (O2). Although some bacteria use free molecular oxygen to degrade organic compounds (aerobic respiration), most bacteria are capable of using another molecule to degrade organic compounds (anaerobic respiration). Bacteria degrade organic compounds in order to obtain carbon for cellular growth and reproduction and energy for cellular activity. Bacteria growth and reproduction in the sewer system results in an increase in the biofilm that covers sewer mains. Bacterial degradation of organic compounds or respiration occurs inside bacterial cells and results in the release of carbon atoms and electrons as chemical bonds in the organic compounds are broken. The carbon atoms are used to produce new cellular material, while the electrons are used to obtain energy. Energy is obtained from the electrons as they are moved through the cell from one protein molecule to another (an electron transport system). Eventually, the electrons are removed from the cell. There are several molecules that may be used by bacteria to remove the electrons from the cell. The molecules include free molecular oxygen, nitrate ions (NO3-), nitrite ions (NO2-), sulfate ions (SO4=) and an organic compound. Aerobic respiration occurs when bacteria use free molecular oxygen to degrade an organic compound. Aerobic respiration results in the production of carbon dioxide, water and an increase in the number of bacteria. There are several forms of anaerobic respiration, i.e., the degradation of an organic compound without the use of free molecular oxygen. These forms include anoxic respiration, sulfate reduction, fermentation and methanogenesis. Only sulfate reduction and fermentation result in the production of significant malodorous compounds. Anaerobic respiration occurs when free molecular oxygen is not available or an oxygen gradient is present . Anoxic respiration occurs when nitrate ions or nitrite ions are used by bacteria to degrade an organic compound. Because nitrite ions are unstable, more bacteria use nitrate ions than nitrite ions. Anoxic respiration results in the production of carbon dioxide, water, molecular nitrogen (N2), nitrous oxide (N2O) and an increase in the number of bacteria. Anoxic respiration is commonly reported in secondary clarifiers of activated sludge processes. Here, anoxic respiration is known as denitrification, rising sludge and clumping. The presence of nitrate ions and nitrite ions in the secondary clarifiers usually is due to the occurrence of nitrification in the aeration tanks. Nitrification is the oxidation of ammonium ions (NH4+) by Nitrosomonas to nitrite ions and the oxidation of nitrite ions to nitrate ions by Nitrobacter. Unless an industry, such as a meat processing plant or steel manufacturer, discharges nitrate ions or nitrite ions or a nitrate-containing compound, calcium nitrate (Ca(NO3)2) is added to the sewer system for malodor control, and anoxic respiration does not occur in the sewer system. Nitrification does not occur in the sewer system. There are four conditions that prevent nitrification. First, the nitrifying bacteria, Nitrosomonas and Nitrobacter, are strict aerobes, and free molecular oxygen is either absent or relatively small in concentration. Second, the number of nitrifying bacteria is relatively small. Third, the short retention time in the sewer system does not permit adequate removal of soluble, organic compounds to permit nitrification. Fourth, several forms of soluble, organic compounds that inhibit nitrification may be discharged to the sewer system or are produced through anaerobic activity in the biofilm, sediment and wastewater of the sewer system. Forms of anaerobic respiration that result in the production of malodorous compounds are sulfate reduction and fermentation. Sulfate reduction and fermentation occur in sewer systems. Malodorous compounds produced through anaerobic respiration include numerous volatile organic compounds, including VFAs. Volatile fatty acids are short-chain acids that vaporize or evaporate at atmospheric pressure. If nitrogen-containing and sulfur-containing compounds, such as proteins and amino acids, are degraded, nitrogen-containing, malodorous compounds and VSCs are produced. For example, the amino acid cysteine (SH-CH2-CH(NH2)COOH) that is found in many proteins releases ammonia and hydrogen sulfide when it is hydrolyzed in the sewer. Sulfate reduction occurs when sulfate ions are used by bacteria to degrade organic compounds. Bacterial respiration of organic compounds using sulfate ions results in the production of carbon dioxide, water, hydrogen sulfide, malodorous compounds and an increase in the number of bacteria. Hydrogen sulfide is the major, malodorous compound produced through anaerobic respiration using sulfate ions. Hydrogen sulfide enters the atmosphere under low pH conditions. Sulfide ions (HS-) are soluble in wastewater under high pH conditions. These ions contribute to the undesired growth of filamentous organisms, such as Thiothrix spp. and Beggiatoa spp., that can oxidize sulfides and many of the acids produced through anaerobic respiration. These filamentous organisms often are responsible for settleability problems in activated sludge processes. Fermentation occurs when an organic compound is used to degrade another organic compound. There are numerous bacteria that use different enzymatic systems or pathways to ferment. These pathways result in the production of a large variety or mixture of acids and alcohols. Fermentation through these different pathways is referred to as mixed acid and alcohol production. Fermentation of organic compounds results in the production of carbon dioxide, water, a large variety of acids and alcohols, malodorous compounds and an increase in the number of bacteria. Methanogenesis occurs when methane-forming bacteria convert hydrogen and carbon dioxide to methane and water or degrade volatile acids, such as acetic acid, to methane and carbon dioxide. Except for methanogenic activity in anaerobic digesters, methanogenesis usually can be excluded as a significant means of malodorous compound production. When respiration occurs, electrons are transferred from the degrading organic compound to an electron transport molecule, such as free molecular oxygen, nitrate ions, nitrite ions, sulfate ions or another organic compound. The transfer of electrons is known as an oxidation/reduction reaction. When oxidation occurs, electrons are removed from the degrading organic compound, while electrons are added to the electron transfer molecule. Within the wastewater of the sewer system there are oxidized compounds, for example, nitrate ions and reduced compounds, such as ammonium ions. All oxidized compounds and reduced compounds posses an electrical charge, a positive or negative millivolt (mv) value. The occurrence or potential for an oxidation/reduction reaction can be determined by monitoring the oxidation/reduction potential (ORP) of the wastewater (Table 1). Because respiration requires oxidation/reduction reactions, the ORP of the wastewater indicates the form of respiration that is likely to occur. Therefore, the ORP of the wastewater can be used as a control measure to indicate suspect or actual sites of undesired anaerobic respiration and malodorous compound production. Although ORP is useful in locating sites of malodorous compound production, appropriate measures are needed. Control of anaerobic activity and malodorous compound production can be achieved through several biological, chemical or physical measures. The addition of nitrate to the sewer system where a malodorous condition exists produces an anoxic environment when dissolved oxygen is depleted. Nitrate can be added to the sewer system as a salt, for example, calcium nitrate (Ca(NO3)2). The addition of nitrate raises the ORP of the sewer system. In the presence of nitrate, bacterial respiration through sulfate reduction and fermentation is suppressed. However, excess nitrate in the sewer system results in rapid depletion of soluble organic compounds. This depletion reduces the strength of the influent wastewater and may affect the ability of an activated sludge process to remove its permitted, removal efficiency requirement for carbonaceous, biochemical oxygen demand (cBOD). Therefore, the rate of nitrate addition must be carefully controlled. Bioaugmentation is the addition of highly concentrated, commercially prepared bacterial cultures to a sewer system or an activated sludge process to control malodorous compounds. Dry and liquid cultures may be added. Bacteria are present in the cultures in relatively high concentrations, such as millions per milliliter and billions per gram. Bioaugmentation cultures are formulated by isolating naturally occurring bacteria and selectively adapting them to provide enhanced degradation rates for malodorous compounds. Once adapted, the bacteria are very active in degrading numerous nitrogen-containing and sulfur-containing compounds including amines, ammonia, mercaptans and hydrogen sulfide. A number of chemicals may be added to the sewer system to control the production of malodorous compounds, especially hydrogen sulfide. Chemicals commonly used include sodium hydroxide (NaOH), calcium hydroxide (Ca(OH)2), chlorine (Cl2), hydrogen peroxide (H2O2), ozone (O3) and metal salts. By increasing the pH of the sewer system to > 12 with sodium hydroxide or calcium hydroxide, the biofilm degrades. With the degradation of the biofilm, the production of malodorous compounds is temporarily arrested. With the regrowth of the biofilm, production of malodorous compounds may resume. The use of chlorine to control the production of malodorous compounds has biological and chemical impacts. Biologically, chlorine disinfects, i.e., it kills many bacteria that are responsible for the production of malodorous compounds. Chemically, chlorine oxidizes sulfide to sulfur (S). Hydrogen peroxide and ozone disinfect. The compounds degrade the sulfate-reducing bacteria in the biofilm. Hydrogen peroxide also oxidizes sulfides to sulfur or sulfate ions. Metal salts, such as chlorides of iron (Fe II and Fe III), may be added to the sewer system to precipitate sulfides. The use of the metal salts results in the formation of the insoluble iron sulfide (FeS). Thorough and periodic cleaning of the sewer system helps to remove or reduce the biofilm and sediment that permit anaerobic respiration. Hydraulic flushing and winching of sewers may be needed in order to prevent anaerobic respiration. Sewer systems should be designed to reduce the amount of turbulence of anaerobic wastewater and the release of malodorous compounds to the atmosphere. Sewer systems also should be designed to reduce the amount of solids (sediment) that accumulates. 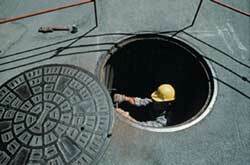 Ventilation of sewers and treatment of vented air should be considered. Scrubbing, oxidation or biofilm can treat malodorous compounds in the vented air. Ventilation also reduces the amount of moisture on sewer walls. The reduction of moisture helps to reduce anaerobic activity. The release of hydrogen sulfide to the atmosphere is strongly dependent upon pH. It is only the molecular or non-dissociated form (H2S) that can be emitted. With decreasing pH (< 7), more and more hydrogen sulfide is released to the atmosphere. Therefore, with increasing pH less and less hydrogen sulfide is released. However, increasing pH to values > 9.0 results in the production and release of more ammonia to the atmosphere. By increasing the dissolved oxygen concentration in the sewer system, anaerobic respiration is prevented. The amount of dissolved oxygen needed is determined by the aerobic respiration rate of the biofilm and wastewater. Reaeration can be achieved through the injection of air or pure oxygen. Sulfate reduction or the production of hydrogen sulfide usually does not occur in gravity sewer systems when the dissolved oxygen concentration is greater than 0.5 mg/l. VOCs may be discharged to the sewer system from industries. The VOCs discharged by industries are usually hydrocarbons and similar products. If the VOCs discharged by industries present a malodorous problem, the dischargers of VOCs should be identified and regulated. This article originally appeared in the September 2002 issue of Environmental Protection, Vol. 13, No. 8, p. 18.